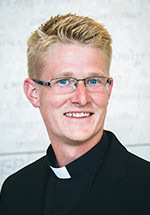 Andrew Sullivan, who also is a first-year theologian, at Kenrick Glennon Seminary in St. Louis, will be installed as a lector in April with our Bishop Robert Gruss presiding. able to attend this celebration of the Ministry of Lector. After the celebration, I sent a text to Adam, his parents and Father Lane congratulating Adam and asking them to send pictures from the installation, which they did. “More work to be done. More invitations to be extended,” I replied. One of the goals in our diocesan Priority Plan calls for the formation of a vocation committee in each parish or parish grouping to encourage and promote a culture of vocations. Building a culture of vocations, as we hear and pray our diocesan vocation prayer every Sunday in our parishes, begins by creating an environment where all disciples will seek the will of Christ. This is what the church means by the universal call to holiness. Fostering a culture of vocations in our lives, families and parishes begins with the call to holiness — a deep, personal and intimate relationship with Jesus Christ as our Lord, Savior, and friend. As Pope Francis said: “to be a saint is not a privilege for the few, but a vocation for everyone.” He continued: “We must remember that holiness is a gift from God — it is not something we can achieve on our own.” Holiness, he continued, is living with love and offering Christian witness in our daily tasks that we are called to become saints… “Always and everywhere you can become a saint, that is, by being receptive to the grace that is working in us and leads us to holiness” (General Audience, September 2014). The key to encouraging and promoting a culture of vocations begins in the family and is nourished and supported in our parish communities. We know the family is the primary community for the transmission of the Christian faith. Our primary vocation, and the heart of building a culture of vocations in the parishes of our diocese is by living our faith with courage and joy. 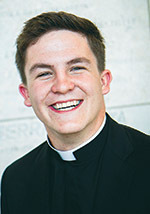 St. John Paul II said, “Our Christian communities must become genuine schools of prayer where the meeting with Christ is expressed not just as an imploring help but also in thanksgiving, praise, adoration, contemplation, listening and ardent devotion until the heart truly falls in love” (Novo Millennio Ineunte). Our first step in encouraging and promoting a culture of vocations in our lives, families, parishes and diocese is helping our people to fall in love with Jesus. 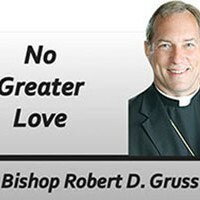 We must live our faith with courage and joy and be willing to share with others our personal friendship with Christ.